Gorkha Janmukti Morcha (GJM, GJMM or GOJAM) is a registered unrecognized political party which campaigns for the creation of a separate state Gorkhaland within India, out of districts in the north of West Bengal. The party was launched on 7 October 2007. Bimal Gurung, a former GNLF councillor of the Darjeeling Gorkha Hill Council, fell out with Subhash Ghisingh for "opposing the Sixth Schedule status for the hills and for his speeches against Subhash Ghisingh, the party president". Gurung who was considered one of the most powerful leaders of the hills, stated to oppose the Sixth Schedule bill even though it had received Cabinet approval in the Indian Parliament. He founded GJM on 7 October 2007. The aims and the objectives of the new party was to "fight for the democratic right of the Indian Gorkhas living in India and (to) work unitedly for the creation of separate state for the people residing in the three Hill Sub-Division of Darjeeling, Siliguri Terai and Dooars areas. GJM’s opposition of the sixth schedule and demand for Gorkhaland was supported by Dr Mahendra P. Lama, Dr Vimal Khawas, and other parties as well, viz. the Communist Party of Revolutionary Marxists (CPRM), the BJP, the Congress and the Akhil Bharatiya Gorkha League (ABGL). The BJP organised an all-party meet attended by ABGL, the CPRM, the Congress, the Gorkha Rashtriya Congress, the Trinamool Congress, the GJM and the Bharatiya Gorkha Parisangh (BGP), which adopted a resolution asking the state to drop the Sixth Schedule proposal and remove Ghisingh as caretaker administrator of the Darjeeling Gorkha Hill Council (DGHC). The Hill parties did not want the Sixth Schedule as Clause 11 of the Sixth Schedule stated "this in principle Memorandum of Settlement is the full and final settlement of the Darjeeling Hill Areas issue and no further demands in this regard would be entertained". GJM burnt copies of the 1988 Memorandum of Settlement which had categorically stated, "the GNLF agree to drop the demand for a separate State of Gorkhaland", thereby reviving the century old demand of Gorkhaland. The GNLF tried stalling the GJM through various means, and an FIR was also lodged against the party president Bimal Gurung for the attack on a former DGHC councilor K.B. Gurung, but anticipatory bail was granted to Bimal Gurung. GJM observed hunger strikes, indefinite strikes and prevented locally produced goods from reaching the rest of Bengal, as a protest against the imposition of the Sixth Schedule and for the removal of Subhash Ghisingh. A team was also deputed to New Delhi to apprise the national leaders about the general consensus of the people of the DGHC area because of which, L.K. Advani refused to support Buddhadeb Bhattacharya’s bid to push Darjeeling into Sixth Schedule. The Bharatiya Janata Party’s refusal of the sixth schedule status for DGHC pushed it to the Parliamentary Committee. The Parliamentary Committee in its findings suggested that "the Ministry of Home Affairs is required to make a fresh assessment of the ground realities all over again before proceeding with the Bills in the two Houses of Parliament". The Sixth Schedule bill was thus put in the back burner. The only supporter of the Sixth Schedule, Subhash Ghisingh, was banned from entering the hills. Ghisingh was finally forced to resign on 10 March 2008 as DGHC caretaker. The demand for a separate state for the Gorkha(Nepali) within India is more than 100 years old. "The name "Gorkhaland" is claimed to have been coined by Subhash Ghisingh on 5 April 1980, cf., his speech of 7 September 1989 at Darjeeling". After a violent agitation in the 1980s, which claimed more than 1200 lives in the hills, Subhash Ghisingh settled for the DGHC. After a lull of Ghisingh's 20 years rule, the demand for Gorkhaland was again revived by GJM under the leadership of Bimal Gurung. The total area of the proposed state is 6246 km2 and comprises Banarhat, Bhaktinagar, Birpara, Chalsa, Darjeeling, Jaigaon, Kalchini, Kalimpong, Kumargram, Kurseong, Madarihat, Malbazar, Mirik and Nagarkatta. Unlike the 1980s, GJM has maintained that the struggle for Gorkhaland would be through non-violence and non-cooperation. GJM initially resorted to bandhs, hunger strikes and non-payment of utility bills to further their demand. It was quite enough to get the attention of the State Government, who invited them to Kolkata for bipartite talks. GJM refused to attends the talks as the state Government had set preconditions that they would discuss developmental issues but not Gorkhaland. The Chief Minister extended the invitation again and denied having set any preconditions for the talks. The first tripartite talks between Government of India, Government of West Bengal and leaders of the Hill Parties headed by GJM was held on 8 September 2008. The hill delegation also submitted a 51-page memorandum to the Union Home Secretary, Government of India. "The demand for a separate state within the Constitutional framework and within the Indian Union, consisting of Darjeeling District and the Dooars region of West Bengal is arguably the oldest and most outstanding demand in the country today. This demand for separate statehood is founded on the bedrock of a historical, economic and political rationale. Against the backdrop of socio-economic exploitation, political and cultural hegemony, misgovernance and exclusion, the demand has become an expression of the ingrained and deep rooted aspirations of the people to secure to themselves, and to their succeeding generations, the right to determine their own future." After three and a half years of agitation for a state of Gorkhaland, the GJM reached an agreement with the state government to form a semi-autonomous body that will replace the DGHC to administer the Darjeeling hills. A bill for the creation of Gorkhaland Territorial Administration (GTA) will be introduced in the West Bengal Legislative Assembly soon. The GTA will have administrative, executive and financial powers but no legislative powers. The Memorandum of Agreement for GTA was signed on 18 July 2011 at Pintail Village near Siliguri in the presence of Union Home Minister P. Chidambaram, West Bengal chief minister Mamata Banerjee and Gorkha Janmukti Morcha leaders. The agreement was signed by West Bengal Home Secretary G.D. Gautama, Union Home Ministry Joint Secretary K.K. Pathak and GJM general secretary Roshan Giri. On 29 October 2011, the Gorkha Janmukti Morcha and the Akhil Bharatiya Adivasi Vikas Parishad (ABAVP), Dooars Unit signed an 18-point agreement at Mongpong, after which these organisations jointly proposed a new administrative body called the Gorkhaland and Adivasi Territorial Administration (GATA) in place of the GTA. The Gorkha Janmukti Morcha announced that it would contest the GTA polls, which it had earlier threatened to boycott over the Justice Sen-headed committee recommendations on territorial inclusion of the Dooars and Terai that it had rejected. The Gorkha Janmukti Morcha announced the names of its GTA election nominees. Following Trinamool Congress' decision not to contest the GTA election, GJM won all 45 seats. From the beginning of 2013, tensions started to surface between the TMC and the GJM. Following the announcement of the creation of the new state of Telangana, the hills erupted into a new phase of agitation. This was characterised by strikes, 'Janata Curfews' (in which townspeople stayed in side their houses), mass protests and the deployment of the CRPF into the hils. During the agitation, Banerjee favoured the Lepcha community with a new Development Board and encouraged other backward communities within the hills to seek further favours from the TMC. This had the effect of breaking down the Hills' united front and GJM's popularity. The TMC also gained electoral support in the hills during this period, as many sought to seek the favours of the new government. The GNLF also started to return to the hills in this period. Many GJM leaders were arrested and detained for extended periods for charges from several years before. On 21 May 2010, Madan Tamang, the Akhil Bharatiya Gorkha League leader and a vocal opponent of GJM, was attacked near the Planters Club, Darjeeling by suspected GJM. Three people attacked Tamang directly and one of them hacked him with a sharp weapon. He was rushed to the Darjeeling District Hospital where he soon died. A few days later on 25 May, hundreds of mourners joined his funeral procession in Darjeeling. After the murder, the West Bengal government threatened action against Gorkha Janmukti Morcha, whose senior leaders were named in the police FIR, meanwhile hinting discontinuation of ongoing talks over interim arrangement with the Gorkha party, saying it had "lost popular support following the assassination". On 8 February 2011, three GJM activists were shot dead at Shibshu (one of whom succumbed to her injuries later) by the police as they tried to enter Jalpaiguri district on a padyatra led by Bimal Gurung from Gorubathan to Jaigaon. This led to violence in the Darjeeling hills and an indefinite strike was called by GJM that lasted 9 days. Jaswant Singh, the BJP candidate, supported by the GJM, won the Darjeeling constituency in the Indian general elections 2009 defeating his nearest rival Jibesh Sarkar of the CPI(M) by a margin of over 2.5 lakh votes. The GJM had supported the BJP in lieu of the latter's positive outlook towards the formation of Gorkhaland as mentioned in their party manifesto for the Lok Sabha elections. GJM candidates won three Darjeeling hill seats in the West Bengal state assembly election, 2011 held on 18 April 2011. Trilok Dewan won from Darjeeling constituency, Harka Bahadur Chhetri from Kalimpong constituency, and Rohit Sharma from Kurseong constituency. Wilson Champramari, an independent candidate supported by GJM, also won from Kalchini constituency in the Dooars. TMC hoped to gain the support of GJM for their candidate, Baichung Bhutia for Darjeeling (Lok Sabha constituency) in the Indian general elections in 2014. This was unsuccessful as the party supported the BJP candidate S.S. Ahluwalia. Ahluwalia has claimed that the state government, led by TMC has resorted to scare tactics and electoral fraud to win the election in Darjeeling. Ahluwalia defeated Bhutia by nearly 2 lakh votes. On 18 September 2015, one of GJM's MLAs resigned in protest over the state government's cooperation with the Gorkhaland Territorial Administration. Three days later, the other two quit the assembly. ↑ "List of Political Parties and Election Symbols main Notification Dated 18.01.2013" (PDF). India: Election Commission of India. 2013. Retrieved 9 May 2013. ↑ Joel Rai Tags : Posted: Thu 12 June 2008, 22:45 hrs (12 June 2008). 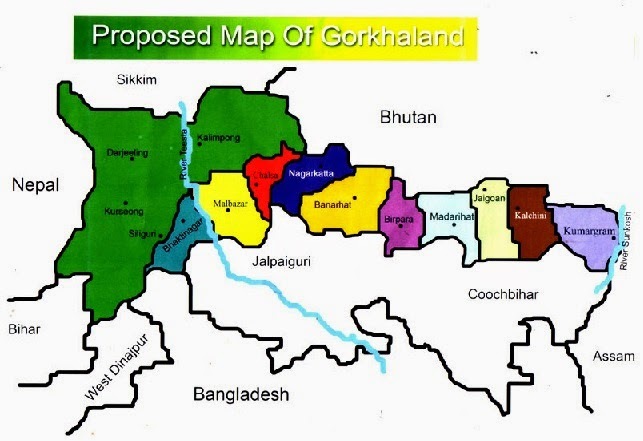 "Redrawing the map of Gorkhaland". The Indian Express. India. Retrieved 19 October 2011. 1 2 Chhetri, Vivek (2 October 2007). "The Telegraph – Calcutta : North Bengal & Sikkim". The Telegraph. Kolkota, India. Retrieved 19 October 2011. ↑ "Hill parties rally behind GJM". The Times of India. 24 February 2008. Retrieved 19 October 2011. ↑ Our Correspondent (16 November 2007). "Sixth Schedule explained". The Telegraph. Kolkota, India. Retrieved 19 October 2011. ↑ "Pro-Gorkhaland statehood demos resurface". Kantipuronline.com. Retrieved 19 October 2011. ↑ "Darjeeling affected for third day". The Hindu. India. 26 November 2007. Retrieved 19 October 2011. ↑ "Fall from grace". The Hindu. India. 3 November 2007. Retrieved 19 October 2011. ↑ "Strike paralyses life in Darjeeling". The Hindu. India. 21 February 2008. Retrieved 19 October 2011. ↑ "GJM announces economic blockade in West Bengal". The Hindu. India. 18 February 2008. Retrieved 19 October 2011. ↑ "Advani spanner in CM Hills Bill plan". The Times of India. 4 December 2007. Retrieved 19 October 2011. ↑ Our Correspondent (19 February 2008). "Ghising tastes his own medicine". The Telegraph. Kolkota, India. Retrieved 19 October 2011. ↑ Express news service (20 February 2008). "Indefinite Bandh in Darjeeling till demand for statehood met: Morcha". The Indian Express. Retrieved 19 October 2011. ↑ "Ghising Quits as an administrator". The Hindu. India. 11 March 2008. Retrieved 19 October 2011. ↑ "The Cause Kicks The Rebel". Tehelka.com. Retrieved 19 October 2011. ↑ "Opinion / News Analysis : New drumbeats in the Darjeeling hills". The Hindu. India. 15 March 2008. Retrieved 19 October 2011. ↑ Map of Gorkhaland Archived 2 January 2015 at the Wayback Machine. ↑ "GJM places demands, Buddhadeb says no division of West Bengal". The Hindu. India. 9 May 2008. Retrieved 19 October 2011. ↑ "GJM to stage hunger strikes from Thursday". The Hindu. India. 30 April 2008. Retrieved 19 October 2011. ↑ "West Bengal: GJM rejects talks offer". In.rediff.com. 13 June 2008. Retrieved 19 October 2011. ↑ "Buddhadeb invites GJM for talks again". Ndtv.com. 19 June 2008. Retrieved 19 October 2011. ↑ "Tripartite talks for Gorkhaland begins today .". The Indian Express. 9 September 2008. Retrieved 19 October 2011. ↑ "51 Page memorandum submitted by GJM during the Tripartite Meeting at New Delhi". Mygorkhaland.wordpress.com. Retrieved 19 October 2011. ↑ "Darjeeling issue solved: Mamata". The New Indian Express. India. 8 June 2011. Retrieved 19 October 2011. ↑ "Darjeeling tripartite pact signed for Gorkhaland Territorial Administration". The Times of India. 18 July 2011. Retrieved 19 October 2011. ↑ "Gorkhaland Territorial Administration Agreement Signed". News.outlookindia.com. Retrieved 19 October 2011. ↑ "Gorkha Janmukti Morcha to contest GTA elections". The Hindustan Times. 30 June 2012. Retrieved 1 July 2012. ↑ Chhetri, Vivek (5 July 2012). "GTA list of 32 but no Gurung". Calcutta, India: The Telegraph. Retrieved 7 July 2012. ↑ Chhetri, Vivek (6 July 2012). "Gurung in GTA fray". Calcutta, India: The Telegraph. Retrieved 7 July 2012. ↑ As Told To Vivek Chhetri In Darjeeling. (24 May 2010). "Boy who delivered the killer blow". The Telegraph. Kolkota, India. Retrieved 19 October 2011. ↑ "Madan Tamang's body taken out in massive procession". The Hindu. India. 25 May 2010. Retrieved 19 October 2011. ↑ "Tamang's murder threatens to derail Gorkhaland talks". The Times of India. 26 May 2010. Retrieved 19 October 2011. ↑ PTI (8 February 2011). "Two killed in police firing on GJM protesters". The Hindu. India. Retrieved 19 October 2011. ↑ "GJM wins Darjeeling constituency by record margin of votes". Hindustan Times. India. 14 May 2011. Retrieved 19 October 2011. ↑ "GJM wins three Assembly seats in Darjeeling". Zeenews.com. 13 May 2011. Retrieved 19 October 2011. ↑ Last Updated: 18 October 18:58 pm IST. "GJMM to finalise stand today". The Statesman. India. Retrieved 19 October 2011.